Product prices and availability are accurate as of 2019-04-18 20:12:44 UTC and are subject to change. Any price and availability information displayed on http://www.amazon.com/ at the time of purchase will apply to the purchase of this product. 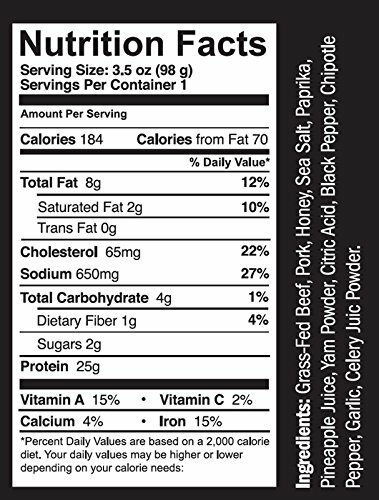 Ingredients: Grass-Fed Beef, Pork, Honey, Sea Salt, Paprika, Pineapple Juice, Yam Powder, Citric Acid, Black Pepper, Chipotle Pepper, Garlic, Celery Juice Powder. Meat is stuffed into a beef collagen casing. 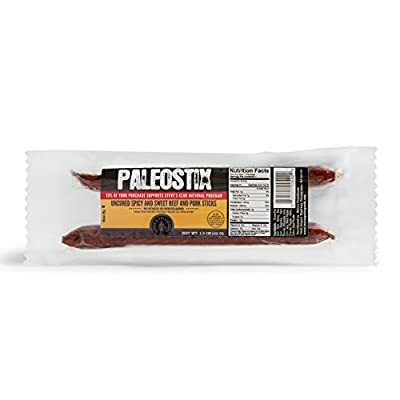 Blend of high-quality pork and 100% Grass-fed beef, raised without antibiotics or added hormones, Nitrate-free, Gluten-free, No Refined Sugar, No Junk Added, No preservatives. 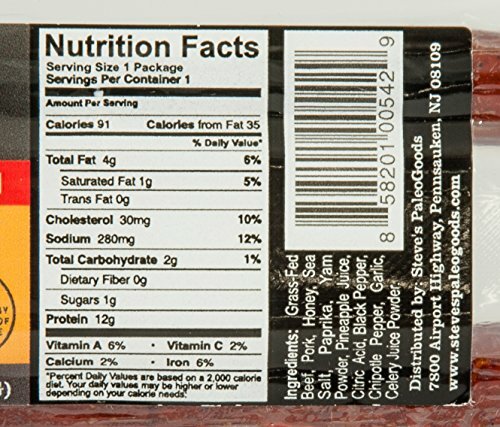 2 sticks per package for a total of 12g of on-the-go protein. 1 year shelf-life. Steve's PaleoGoods is a small family owned and operated business since 2008. Our products are made by hand in small batches, using the best ingredients, as close to nature as possible. 15% of proceeds fund our non-profit Steve's Club that brings fitness, nutrition, and mentorship to at-risk youth across the country.